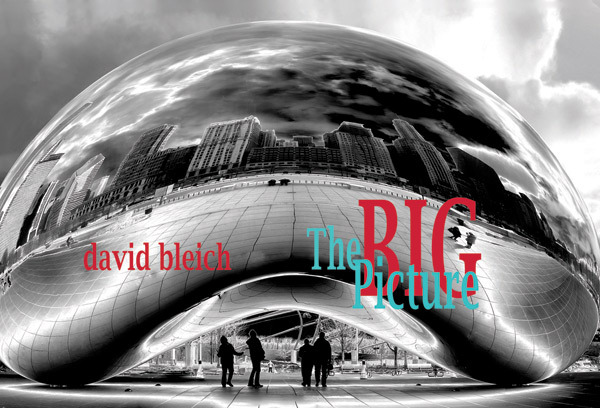 Image City Photography Gallery's current exhibit is The Big Picture by David Bleich. Large photographs have certainly taken over the featured-artist walls at Image City. David, a Professor of English at the University of Rochester, has meticulously combined hundreds of individual images to produce fine detailed photographs, predominantly architectural and cityscapes with a dash of diverse whimsey in others. His view of Manhatten looking north from the World Trade Center is nearly 15 feet wide. Visitors are enjoying identifying locations from the large photographs from Boston, San Francisco, Detroit and Chicago. When commenting on David's exhibit for a Peter's Pick, Peter Marr observed "In this scintillating exhibition, which includes many very large prints, David has given us truly thought-provoking photographs. The latter are images of affirmation from an artist whom Ralph Steiner would describe as 'Thinks with his Eyes.' The author has an innate creativeness in looking at things in a different way, which reminds me of a profound observation from Beaumont Newhall, namely, 'We are not interested in the unusual, but in the usual seen unusually.'" Guest artists include John Solberg, who with gallery partner, Don Menges, has produced an exquisite photographic view of Rochester's Frank Lloyd Wright Boynton House. John's view is in black-and-white, while Don's is color, making a wonderful comparison of styles. Chip Evra, Joseph Lamperez, and Jim O'Neill are additional guest photographers, each with a portfolio of work ranging from under-sea, exotic lands, and local landscapes. Additionally, John Ejaife, Carlton D. Hansen, Norm Ishler David Kotok, Luann Pero, and John Williamson, have an exhibit of their winning photographs from Camera Rochester competition. Click here for a link to the details and preview of images in the show.The exhibit runs through Sunday, February 17. There is no admission fee at Image City and is accessible to all. During each of our shows, Peter Marr selects several of his favorites from the work of guest photographers in the show and writes about them with a brief review. For The Big Picture Peter has chosen four "Peter's Picks". We have abreviated the discussion some for the newsletter. You can also find the full discussion and larger images by clicking here. 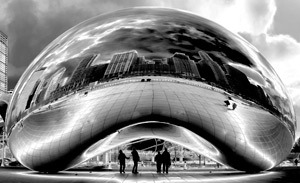 Jellybean by David Bleich is featured on the showcard for the exhibit. In making this selection, Peter noted " In Jellybean, the huge and impressive sculpture is fully deserving of its imposing placement in a very large print. The drama and awesome impact of the entire image is certainly visually enhanced by the black and white format, and the astute use of software techniques that are artfully and meaningfully done. The tonal range is exceptional, with a dynamic range of values which enhances the 3-dimensional impact, and exhilaratingly captures every creative curve and design features of this monumental and inspiring sculpture. Expressively reflected in the latter are a majestic array of tall buildings with a dramatic background skyscape and a plaza forecourt of patterned concrete tiles....... This is a virtuosic and masterly print, where the artist has captured a fabulous sculpture in a unique and exceptional way." A second selection of David' work is titled Trucks. Peter commented "This is a stellar and extremely compelling print of a group of closely aligned trucks, in which the resplendent colors and elaborate subject detail have been impressively enhanced by the artist. It is a great tribute to David, that this very large, awe-inspiring image, would have been foremost in Somerset Maugham's mind, assuming he could have seen this print, when he stated, 'It is a funny thing about life, if you refuse to accept anything but the best, you often get it.' In Trucks, the creative use of an awesome color palette of saturated hues, together with the elaborate and meticulous detail in each of these authoritative rigs, results in a fabulous and uplifting print, befitting these noble 'Kings of the Road.' In this huge, horizontal print, I particularly admire the way in which the author has presented these leviathans as massive vertical elements, which creatively emphasizes the power and character of each individual truck, giving each one a commanding presence and pride of their own. Each of them are especial, but together they form an impregnable line, virtual goliaths at rest, and in everyone's mind as they resolutely overtake us on the open highway......."
Peter also slected Masai Mother and Child by Joseph Lamperez noting that "This is a powerful and haunting family portrait, that aesthetically illustrates how spontaneity is an essential component of the photographer's art. This charming image also delightfully refutes some supposedly photographic maxims, by having the subjects placed right in the center of the frame, and capturing two subjects, where the eye is said to prefer one or three. Although there is some obvious apprehension in the mother's expression, the artist inspiringly elected not to pose her and her young child outside the dwelling, even though this option was probably available. The end result is a wonderfully poignant and electrifying image, full of drama and atmosphere, one that speaks to us so meaningfully regarding the poverty, plight and resilience of the Masai people. The dwelling itself highlights the humble living conditions, evidenced by the mud-cracked walls, the decaying base structure, the crude wooden pole supporting a thatched roof, and a hingeless door that just serves as a moveable cover for the entranceway. On a more positive note, the walls have a warm color of reddish ochre, complementing the mother's lovely brightly colored garments, and multicolored strings of beads and necklaces...... 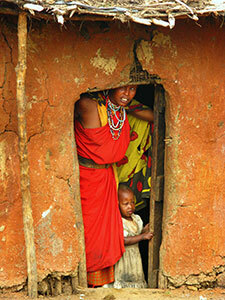 This uplifting portrait is wonderfully seen and captured, allowing the viewer to not only admire its beauty and serenity, but to look beyond what one sees, and to try to imagine what life must be like in this rural area of Africa, where the Masai are pastoral and hunting people of Kenya and Tanganyika." With Peter's choice of Covered Bridge by Jim O'Neill he commented: " This spectacular print, together with three other images in Jim's portfolio, are in my mind wonderful examples in which digital technology brilliantly enhances the picture. Certainly, our perception of photographs is biased, so we reconstruct them in ways that are meaningful to ourselves and to viewers. A standard record shot of this bridge scene could easily grace a calendar or picture postcard, but the artist has skillfully reworked and delightfully embellished the standard view, to enlighten us with a magical transformation, that is both masterly and uplifting. The color range and quality is exceptional, offering a sumptuous array of exquisite autumnal hues, which contrast inspiringly against the lovely blues and greens. These gorgeous colors arouse all of our emotions, and appeal to and captivate our subconscious. There is a warmth and vitality in this impressive print that is timeless, bringing this rustic bridge to life in an idyllic setting....... This is a creative and expressive example of how the vision and manipulative skills of the author have resulted in a breathtaking image for every viewer to marvel at and enjoy." Image City is proud to announce that the show beginning February 20th is our 100th exhibit. As it happens, this is also the Peter's Picks Retrospective - 2011 show. To commemorate our 100th exhibit we have produced a limited quantity of T-Shirts with our Image City logo on it together with an embedded "100". These are unique and we don't plan to produce any more, so you may want to grab one for yourself at $20 including tax. Each month, we enjoy a good turnout for Image City Critiques, our program at Image City to provide participants an opportunity to engage in a friendly, constructive, and positive critique and review of their photographs. The sessions are held on the first Wednesday of the month. The assignment for the February 6th meeting of the Image City Critiques Group is B&W photography. The subject is open, but photographers should work to make sure the image they choose is appropriate for a B&W photograph. Also note that we have inaugurated the Image City Critiques Flickr Group. It's a private group on Flickr, so you have to be invited to joint. Contact Don Menges for more information. Image City Photography Gallery will be attending as a proud sponsor of the Niagara Frontier Camera Clubs' 2013 Convention. Check their website for current details. The keynote speakers are Nevada Wier, an award-winning photographer specializing in the remote corners of the world and the cultures that inhabit them, Rob Stimpson, an internationally published, award-winning photographer best known for capturing the wilds of the Canadian outdoors, and Harry Benson, with a photojournalistic look at the last 50 years. Numerous speakers at the convention have many topics of interest to photographers. It will certainly be an instructional and enjoyable weekend of Photography. Visit the NFRCC website at www.nfrcc.org/convention for details and registration information. All local photographers will be pleased to learn of another wonderful opportunity to submit work for the juried show A Photographer's Path 16, an annual exhibit of photography at the High Falls Gallery. In its 16th year, it is always a great exhibit at Rochester's official visitor center where the art exhibits add extra vitality to the permanent displays. Click Here for a PDF documenting the details as well as the entry form. Submissions are to be dropped off on February 13 - 17. The exhibit will run during March and April. For questions contact Sally Wood Winslow at High Falls Gallery 325-2030. For the photographers currently exhibiting in The Magic of Light 2013, please note the request "We respect and support the exhibits of Image City Photography Gallery, but, images displayed in the recent The Magic of Light exhibit will not be accepted for display in A Photographer's Path 16." In that way the their new show at High Falls will meet their goal to create the freshest show possible.